Matched betting does not need to be complicated at all. It simply involves eradicating all possible risk from a sporting event which means there is no gambling involved whatsoever. If you decide to make money from matched betting, gone are the days of gambling and hoping for that specific outcome to occur. Instead you can look forward to creating a sustainable income that can generate several hundred pounds each month without much effort. What is even better is that this can be achieved from the comfort of your own sofa, your own bed; basically your own home! If you have ever gone into a high street bookmakers before or placed a bet online in the hope of making money, you will realise your strategy is based on hope and I will tell you that hope is not a financial strategy, so you shouldn’t adopt it as one. When you place your bets, you cannot control the event to go your way which leaves your bet wide open to all kinds of risk! What no risk matched betting does is make all outcomes profitable whilst removing all the risk. You will make money regardless of the final result and you can sit back and enjoy watching the sporting event you have bet on knowing you have already profited. I describe matched betting as a two-step process that involves placing an initial qualifier back bet at a bookmakers and a lay bet at a betting exchange. Once this qualifier back bet has settled, you will then receive a free bet or bonus from the bookmaker which you can use to guarantee yourself a profit no matter what the final outcome! Now that we have simply defined what no risk matched betting is, I will now dig deeper and further explain the process. Deposit the required amount at the bookmaker website. Use a matched betting provider such as Oddsmonkey which has both oddsmatching software and calculator to work all the simple sums out. Place your deposited amount at the bookmaker’s website. Lay the same selection at a betting exchange. You will receive a free bet or bonus from the bookmaker website after you have placed your qualifying bet with them. Use Oddsmonkey and find a good match on their oddsmatching software and use the calculator to work out the sums. Place the free bet at the bookmaker’s website. This is what matched betting is in a nutshell. 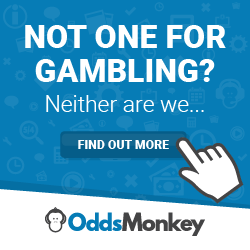 Using a matched betting service provider such as Oddsmonkey is essential as it has all the software and has tutorial videos to fully explain how to the process successfully. I really recommend using them as it will make your initial learning process much easier and you will make money much faster from no risk matched betting. You can read my unbiased Oddsmonkey review here. You can make money from matched betting in several ways. You do not have to just rely on the sign-up offers at all as there are many more opportunities that are to be discovered after you have signed up to all the different bookmakers. You can make money from accumulators, you can make money from each way betting, you can make money from extra place betting, you can make money matched betting in plenty of ways! Doing the sign-up offers with all the different bookmakers is just the start. This is just the start of what is to come. The sign up offers are awesome to start with because they are quick, they are easy to learn and they are very profitable using matched betting. It is a shame that most people assume that once you have all the different bookmaker accounts, you can’t make any more money from matched betting anymore. This is completely false and is very much the opposite. I did all the sign-up offers over 2 years ago and I still don’t have any issues making money each month from those same bookmaker accounts. It is time to be excited and I am delighted to tell you that matched betting really does work. It is totally possible for you to make money from matched betting to cover your mortgage, your rent, your car loan, pay off debts, save up, put your money into an investment account or simply treat yourself to some luxuries. For example, accumulators can make you £5-£10 profit per accumulator. How many of these accumulators would you need to place each month to cover your mortgage or rent? There are 30 days in a month so you have plenty of time to achieve whatever your goals are. I started matched betting in April 2015 and at the very beginning, I was very sceptical and I thought “Oh here we go again, another scam”. However, my friend was telling me about it at the time and he bragged about making £33 tax-free in the space of 5 minutes. This caught my attention and I started to listen. My friend is a fairly credible person and so I trusted his words. I did some research and saw that huge well known bookmakers are the companies that you create accounts with to do it and this is where I knew it was to be trusted. Most scams that exist out there usually require you to deposit all your money into “something” which will then “make you money”. Matched betting doesn’t do this as you are putting your money into credible bookmakers, placing bets with them and then making money, every single time. I got started with matched betting with a small £100 bank. However, I made £40 thanks to my friend’s help. I was very nervous about placing bets online and I had never used a betting exchange in my life but it was a great experience and one that I still look back on when I help people. We all have to start somewhere ultimately. I was working as an accountant at the time when I was doing matched betting. Even working full-time, I was still pulling in £900 extra each month from matched betting within 3 months which really did blow me away! When I saw this potential I had a very clear goal, “I want to quit my job one day and make money from matched betting for a living”. I made a plan and I was going to save plenty of money so that I had a nice big float to have behind me for when I do quit my job and I put away big chunks of change each month for around 18 months. At this point, I knew I was ready to make the leap and quit my job and take the plunge to start doing matched betting for a living. On 23rd December 2016, I left my job. In January and February 2017, I took a few holidays and had plenty of rest after working for a company for 4 years, I felt I needed a real break from everything and that is what I did. I then started matched betting in March 2017 and I made a killing that month. I made £4,130.04, yes four thousand, one hundred and thirty pounds and four pence. I literally placed a bet every single day in March and placed many different kinds of bets; accumulators, new sign-up offers and the copious reload offers that were available that month. The Cheltenham festival also helped and I made £750 across those 4 days alone! This is my biggest profit from matched betting in a single month and is one of my proudest achievements. I was very professional and organised in my approach; I used a spreadsheet to keep track of where my money was and what bets I had placed and how much money I was making. This is crucial for any matched bettor as it is so easy to lose focus and become distracted without clear recordings of your profits. After all, you want to know how much easy money you are making each month! Fast forward to October 2017 and I had made £13,816.91 from matched betting over the 7 months. This meant I had averaged £1,973.84 each month tax-free and risk-free thanks to no risk matched betting. If I was still employed, I would be working in a job that would be paying me £31,000 a year due the income tax and national insurance differences. The tax-free element is really useful and you really do notice the difference, every penny is yours to keep. I’ll cut my matched betting review there as I don’t want to bore you! Overall, from my matched betting experience, I can honestly say it has improved my life, it has improved my lifestyle (no more 9 to 5) and has allowed me enjoy freedom in my early twenties which most people never achieve. It feels awesome so I would recommend matched betting to anyone who is willing to give it a go. Joining a service like Oddsmonkey really helped me in the beginning of my journey and I urge you to give them a try, you will make £45-£50 from their free trial alone! Matched betting signup offers, my guide to profiting from free bets!